Oh, Pumpkin. The best time of the year. Well, until Peppermint season comes around. 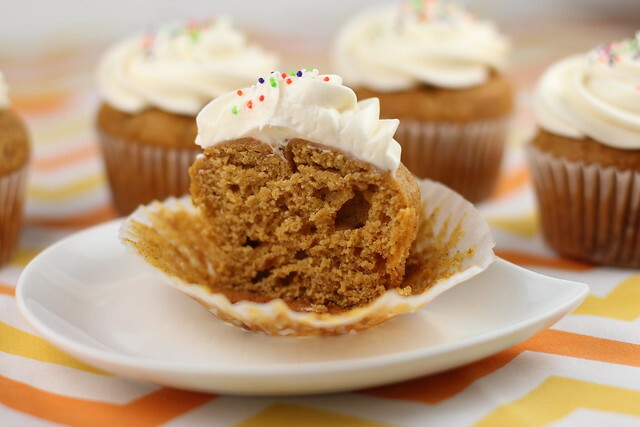 So, let's enjoy pumpkin season with these "Pumpkin Snack Cake baked in Cupcake cups and topped with Maple Cream Cheese Frosting." Kinda a long name, but that's what this is. 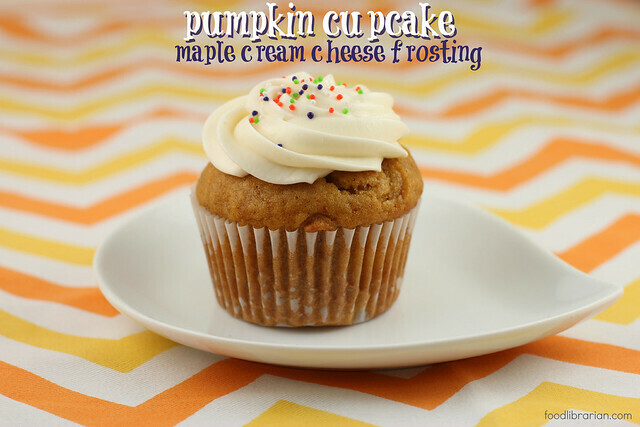 It's not a true cupcake (which I feel should be lighter) - it's has a denser consistency. Not that that's bad! I love snack cakes...thus, with the muffin/snack cake texture, this is perfect 24 hours/day - including breakfast! This cake uses a whole can of pumpkin - very pumpkin-y flavor. I've made it as a snack cake, but the cupcakes are easy to bake and serve. And they look all pretty! The recipe is adapted from Everyday Food from the Martha Stewart empire (I really miss this cooking magazine) and it was baked on the PBS Everyday Food show back in the day. The consistency is more snack cake/muffin. 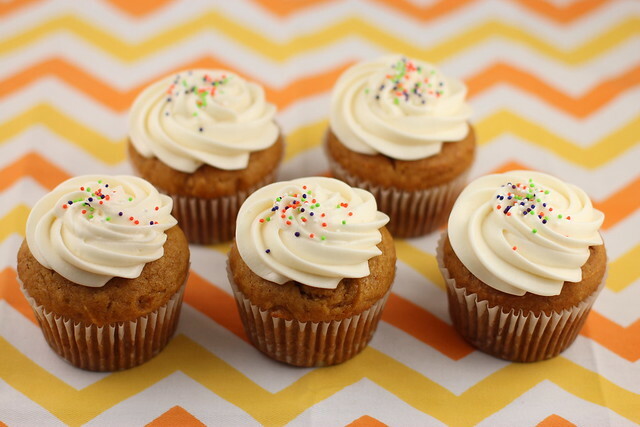 I like that in a pumpkin cake - you should taste and feel the pumpkin! A lot of non-bakers don't believe me, but it is so much faster to pipe frosting with a big tip than spread it with a butter knife or offset spatula. I use disposable plastic piping bags and that makes it super easier. 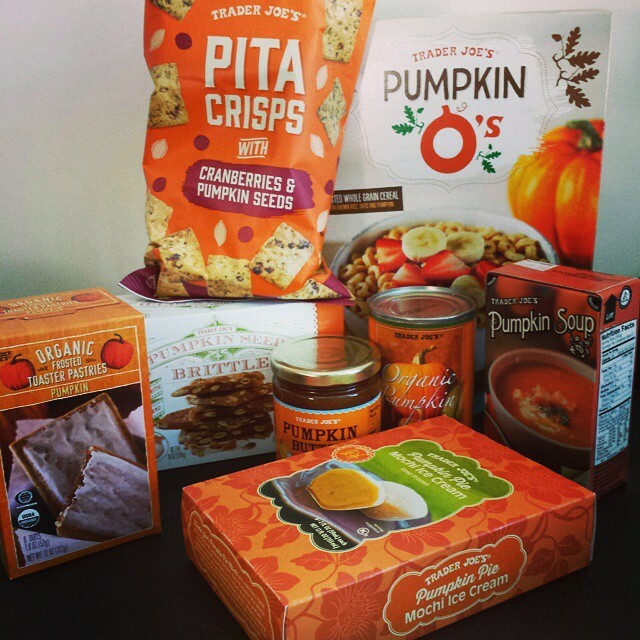 As you can see, I'm kinda crazy about pumpkin and Trader Joe's is too! Have you tried the Pumpkin O's? I'm addicted. And that Pumpkin Brittle? OMG. So good. To tell the you truth, I was going to break off pieces of the brittle and put it on the frosting...but I didn't want to use all the brittle! (sorry co-workers). I love the Pop-Tarts and Pumpkin Butter every year. Oh, and the Pumpkin Mochi Ice Cream? YUM. The Pita Crisps aren't life changing - I'm going to skip them next time. I haven't tried the soup yet. 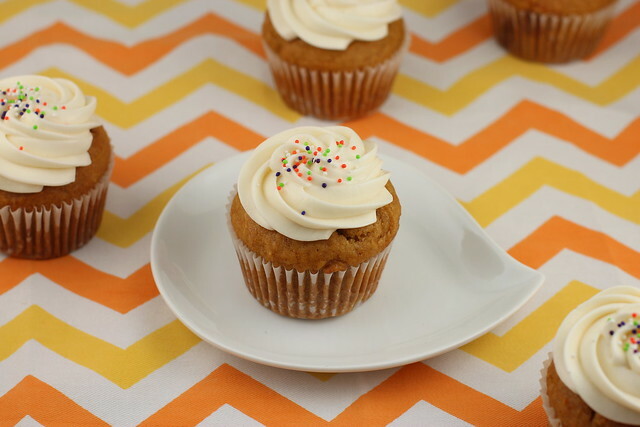 Celebrate Pumpkin Season by making these pumpkin treats! 1. Preheat oven to 350 degrees. Prep muffin tin with liners. I got 17 muffins from this recipe. (Original recipe bakes in a 9-inch square pan). 2. In a large, whisk together flour, baking soda, salt, and spices. 3. In a medium, whisk together eggs, sugar, butter, and pumpkin puree until combined. 4. Fold together the wet and dry ingredients until combined. Don't overmix. 5. Fill muffin cups. I use an ice cream scoop. 6. Bake until a toothpick inserted in center of cake comes out clean. 25-30 minutes. Cool completely before frosting. 1. In a mixer with paddle attachment, cream the butter and cream cheese together until well blended. 2. Add maple syrup and powdered sugar and blend until smooth. 3. Pipe or spread on the cupcakes. Have you tried TJ's pumpkin muffins mix or pumpkin-cranberry scone mix? 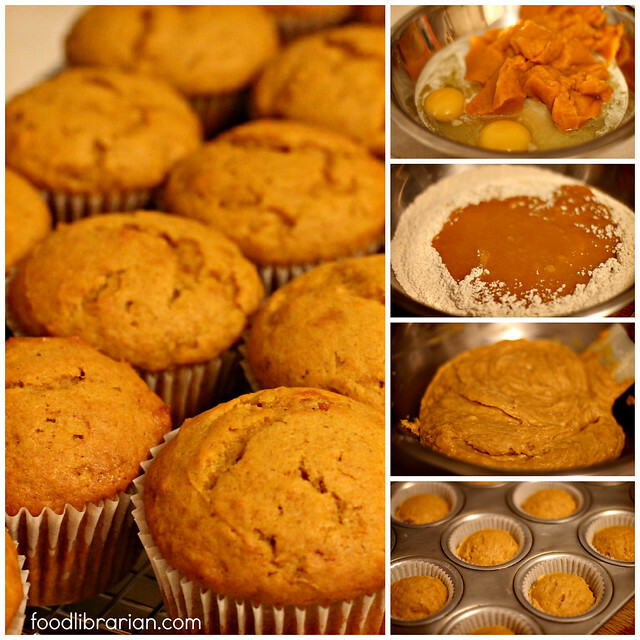 I thought the Muffin mix was a little heavy on the spices but the Pumpkin Scones were mild, tasty and easy to make. Almost like a drop biscuit. Even good when slightly reheated in the microwave.